For those of you keeping track, the weekend is just about upon us. Hours to go, in fact. The same holds true for summer. Well, it’s a bit further away, but close enough to start thinking of hot weather and weekends. I thought of the weekend kit that is the ne plus ultra of American sportswear today whilst heading down Pepper Ave. to pick up my son after a field trip. There, unloading some sort of yard implement from his late-model Mercedes station wagon was the very model of summer rules. Later, reading this post by the redoubtable Tintin and experiencing an itching from the moths that have taken up residence in my wallet, I thought again of the pleasures of the preppy weekend. Bermuda length, plain front khaki shorts. Either true shorts or those made from ancient and venerable khaki trousers. Ribbon belt or one that had been needlepointed for you by a girlfriend/mother/aunt. A polo/tennis collar shirt. It was either Lacoste or B² until Mr. Lauren took a turn and the pony made its appearance. Slightly frayed upturned collar and sun/salt fading optional. Or, as the gentleman spotted on Pepper, a B² OCBD, worn untucked, probably in pink or blue. Sometimes worn layered over the polo/tennis shirt in the chill of morning. 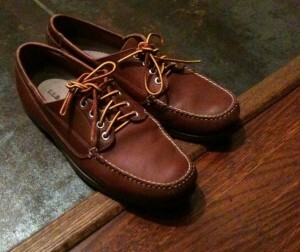 Topsiders or LL Bean camp mocs (the blucher was popular). Very sporty types wore Tretorns or Sperry tennis shoes, also frayed from washing. Vaurnets or Ray-Bans on a strap so as to not lose them when tossing over (leeward) the garbage from the Bloody or the dregs from the beer (off court). There was a brief fad for those disposable painter’s caps or sunvisors, but that was about it. A madras bucket cap was always appreciated. It’s nice to know that certain things haven’t changed. If you can find dead-stock. 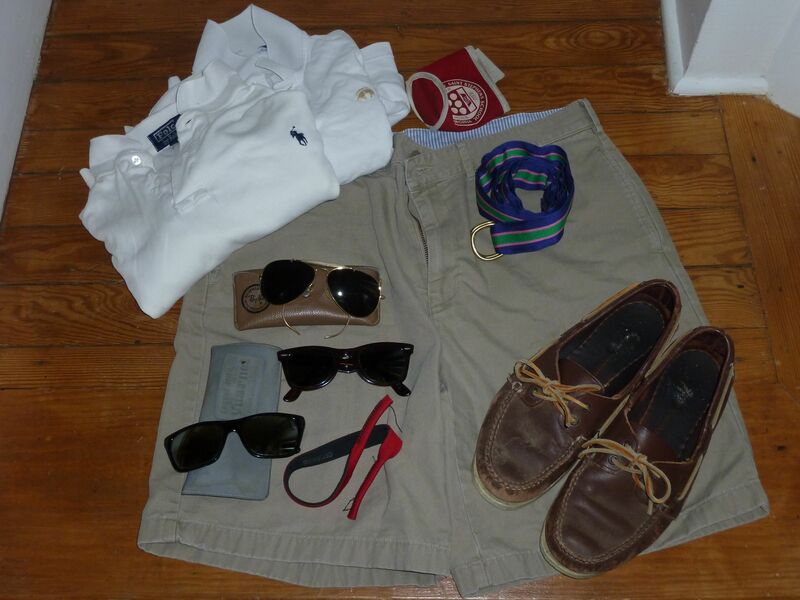 This entry was posted in Living and tagged American sportswear, brooks brothers, Lacoste, LL Bean, Mercedes station wagon, Needlepoint belts, Ralph Lauren, Ray Bans, Ribbon belts, Sperry, The Trad, Topsiders, Tucker Blair, Vaurnet. Bookmark the permalink. Ah, summer. Time for a Californian to complain. Rain yesterday and 35 this morning. Anyway, you’ve done the kit right in that, I believe, summer clothes should be well worn. Circa 1984 and they’re just about hitting their prime. Wish I still had my Topsiders from ’84. They’ve long gone to Sperry heaven. David V, I feel the same way about my B-Squared Corodvan pennys. Piece of glass did them (and almost my toe) in. The Topsiders have held on remarkably well, considering. Turling, Indeed. The Polo shirt does have a paint stain and several holes through it, but it’s fine for the beach. I believe it’s a Boy’s L… . The belt in that first picture made me chuckle…and made me want to go one just like it. Hilariously go-to-hell and wonderful. Awesome kit there old boy. 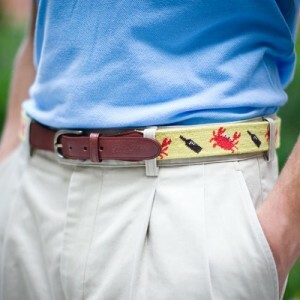 Love that ribbon belt. Well done. Reminder to finish the belt for my weekender. He wears the exact uniform. He loves seersucker pants, polos, bowties and bright pops of color. He will wear a polo till it literally is thread-bare. Damn Yankee. Plus ça change… Toad. That is the beauty of the preppy wardrobe. It simply trots along, oblivious to fashion’s whims. what’s your take on LILLY PULITZER, whether vintage or new? I like a lot of the women’s clothing although the cut can be a bit odd. Most of it is well-constructed. My daughter (5) wears a lot of Lily that she inherits from friends and it stands up to the schoolyard fairly well. The men’s stuff — a little goes a long way. A good bowtie, or pair of GTH pants, or patterned sportcoat is a fun addition for summer. Notice I wrote “or”… .